Every now and then you come upon a place where the creases and folds of the Earth’s crust combine with the local climate to produce a place that doesn’t quite seem as though it ought to exist – in a botanical sense at least. The foothills of the Sierra Nevada mountains in southern Spain have some nooks and crannies like this. The nearby coast is called the Costa Tropical because it’s so warm and frost-free that tropical crops like sugar cane grow there. Meanwhile the mountains themselves, the second highest in Europe, reach way above the tree line. Between those extremes lie a whole series of different climates, with the crops becoming more temperate and cold-tolerant as you climb. 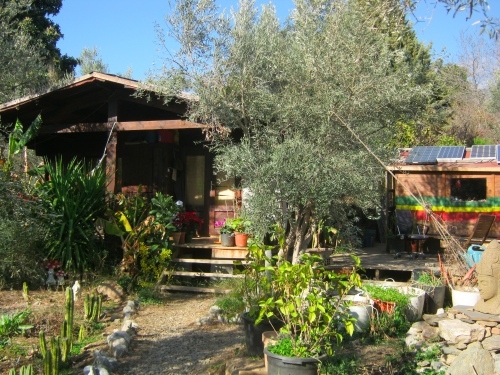 In one of those little folds, near the town of Orgiva, Ras John Cresswell has a permaculture holding of 0.4ha (1ac). It’s just 300m (1,000ft) above sea level and manages to combine both the tropical and the cool temperate, so the range of crops which Ras can grow is quite remarkable. 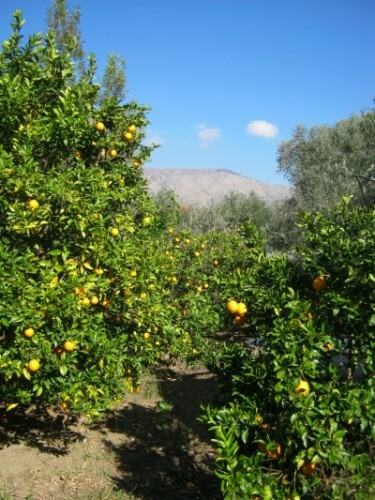 The main crops in the district are olives and citrus fruits. But the cool winter nights with occasional frosts mean he can just manage to grow apples and plums, while the hot summers allow him to get away with avocadoes, though he does have to be careful and choose the right varieties. He’s even got a couple of banana trees. Bananas are completely intolerant of frost but they’re not really trees. Botanically they’re more like enormous grasses, so if the above ground parts get killed off new shoots can come up from the roots. Broad beans under the tree layer. The range of vegetables is equally great. 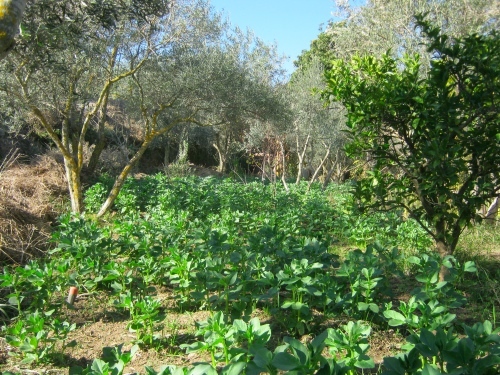 Broad beans do well in winter, even underneath a canopy of olive trees. This double layer of cropping helps boost the productivity of the land. 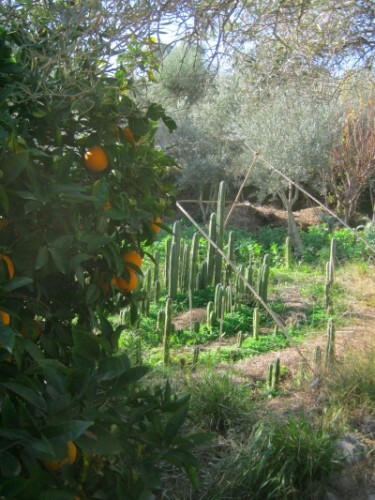 We call it ‘stacking’ in permaculture. 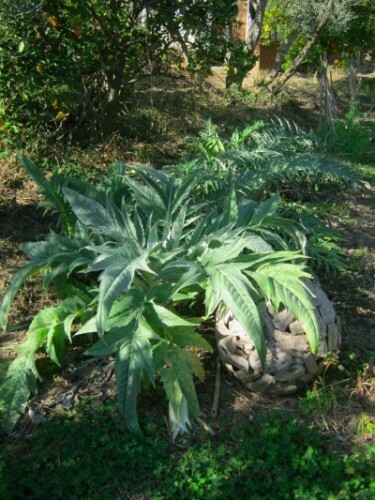 As well as the usual temperate vegetables, heat loving ones like cardoon and globe artichoke thrive, and Ras even grows medicinal cactus in a sunny clearing. The abundance of different crops, both tree and herbaceous, means a steady supply of food for the bees almost throughout the year, with just a short break of a couple of months in winter. Amongst all this this abundance of food there’s very little need for cash. Ras’s modest needs are met mainly by picking olives for neighbours in return for a share in the harvest. Most of the olives are pressed for oil but he preserves the very best of the fruits whole, by storing them in salt for a few months. It’s a skilled job, but then so is growing such a multitude of produce. Ras, with the last cape gooseberry of the season – delicious! 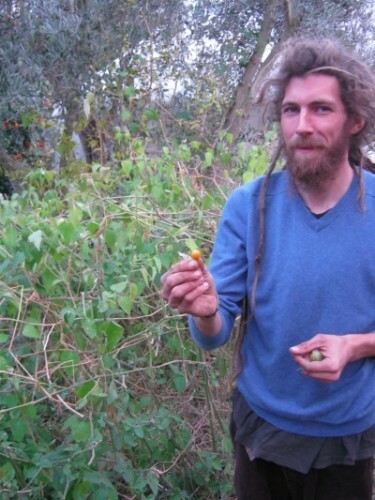 Ras is sharing some of his store of knowledge by putting on a Permaculture Design Course in Orgiva in January. I’ll be doing some teaching on the course as well. For details click here. For more pictures of Ras’s place see my facebook page.